Cargo loading in a bulk carrier involved some limitations. 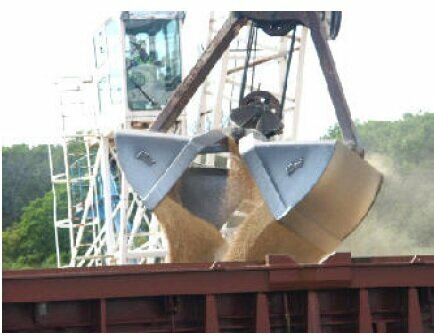 Before loading commences there should be an agreement between the master and the terminal representative as to the rate of loading and order in which the cargo is to be distributed so as to achieve the final loading plan. In general, this agreement should be based on ship specific loading / unloading restrictions. The terminal representative, on receipt of the ship's initial loading plan should advise the master of the nominal loading rate at which the ship may expect to receive the cargo and the estimated time required to complete each pour. The loading plan should be prepared so as to ensure that all ballast pumping rates and loading rates are considered carefully to avoid overstressing the hull. The quantities of cargo required to achieve the departure draft and trim should allow for all cargo on the terminal's conveyor systems to be run off and empty on completion of a loading. The terminal representative should advise the master of the nominal tonnage contained on its conveyor system and any requirements for clearing the conveyor system on completion of loading. The communication arrangements between the ship and terminal should be capable of responding to requests for information on the loading process and of prompt compliance in the event that the master or terminal representative orders loading to be suspended. Consideration should be given to the disposition of cargo on the conveyor systems and to the response time in the event of an emergency stop. .7 communication arrangements between the ship and terminal should be capable of responding to requests for information on the loading process and of prompt compliance in the event that the master or terminal representative orders loading to be suspended. Consideration should be given to the disposition of cargo on the conveyor systems and to the response time in the event of an emergency stop.